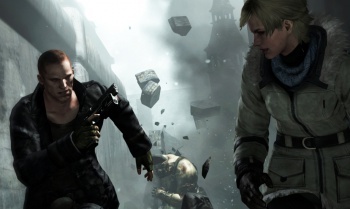 On notice for past DLC practices, Capcom reveals that a free Resident Evil 6 update is coming in the very near future. Earlier this week, some intrepid disc divers discovered additional Resident Evil 6 content hidden away within the bowels of the boxed version of the game, awaiting unlock via a downloadable update. After letting the web's conspiracy theorists once again stew for a few days over the prospect of on-disc paid DLC, Capcom is clearing things up: All of the content that appears on the physical disc will indeed be unlocked for free. "Some data of this update is on the disc, but said data is incomplete and requires the actual download to access. But again, free," the company explains. "Future paid DLC - like the multiplayer modes we revealed a while ago - is not on the disc. We said as much a month ago, but that point may have been lost in the shuffle. RE6 on-disc DLC is free, paid DLC is not on the disc." Said update will add a new difficulty level to the action horror title, as well as allow gamers to embark on Ada's adventure without tackling the rest of the game first. No date has been specified for the update, but the company says it will hit consoles "soon." Capcom has come under fire in the recent past for paid on-disc DLC practices for titles including Dragon's Dogma and Street Fighter X Tekken. In May, the company even went so far as to directly address the growing concern via a post on its official forums. At the time, the company claimed it was re-evaluating the practice for future titles. The ethical argument over whether paid on-disc DLC is a non-issue or a greedy play to squeeze extra revenue from fans will continue - but for the time being, it looks like Capcom has successfully skirted the issue.